The Escapists is a top down RPG puzzle game, created by Mouldy Toof Studios and published by Team17 Digital, available for Windows with an Xbox One version coming February 13th. Chris Wallace previously did a preview article for the site on the Steam version of the game which you can check out here. The goal of the game is simple; Escape from prison. Simple right? Actually from a variety of prisons with different layouts and routines; so I suppose you could pretend to be Stallone’s character from The Escape Plan, minus having Arnold Schwarzenegger for a BFF. By finding weak spots and crafting a variety of items you must plan the perfect escape before the monotony of prison life drives you insane. The game is relentless to the impatient and demands your full commitment and patience. If you’re found with contraband once, all you’re tunnels are found and sealed. This does lead to a huge flaw in the game’s difficulty, regarding how you can be caught. If you steal a guard’s key or leave an open hole then they automatically catch you. Even if you’re hidden in a vent, BAM! Straight into solitary and you’re hole is gone. If the guard’s physically touch you that’s one thing, but to end your plan automatically like that just seems unfair. If they found your tunnel and came after you then that’s one thing, or sealed up the hole that they found, but it’s more the case that they see a hole and instantly teleport you into a cell. Though this does create a huge amount of tension; a master plan can fall apart in a fraction of a second. You need to know when to take risks and when to play it safe, working on the long game. Hell it’s so hard that I haven’t completed the first level; I spent so many hours and came up with so many plans, only to have them fall apart and land me on square one! It’s both a frustrating and addictive experience. The other inmates are another factor to contend with; they will ask you for favours, hold grudges, can be traded with, and can even be recruited into your own little prison crew. This goes for the guards too, who will distrust you if you get caught breaking the rules., but can be bribed by using coins earned through jobs and requests. 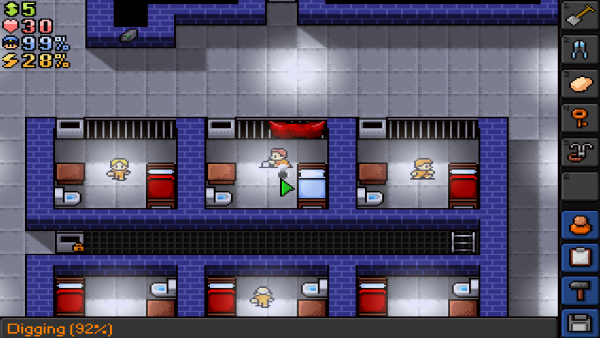 Prison is full of side tasks, like jobs to earn money while granting you access to areas with items you might need, like a metal press where you can get sheet metal from or the laundry where you can sneak out a guard’s uniform. There’s also the internet and libraries where you can increase your intelligence which let you create new items and make you capable of doing new jobs. There’s also weights and running machines to make you faster and stronger, letting you beat up enemies more easily and escape pursuing guards if necessary. Violence is rarely a good solution, unless it’s backed up with a strategy, like waiting until night to avoid the snipers and escaping through a ready and waiting tunnel to get to the main entrance which opens when you defeat all the guards at once. The game has a great mood too, with a simple but detailed 8-bit style, and some great music which changes depending on the time of the day, my favourite being the funky dinner time music. 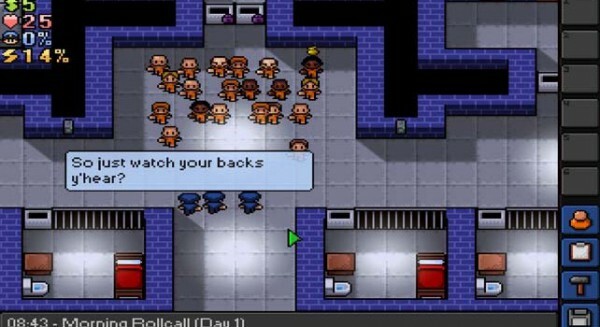 Overall, The Escapists is a complex game with a great mood, despite a difficulty that feels unfair at times. But the difficulty and addictive nature guarantees that you’ll be playing this for a long, LONG time. This entry was posted in Uncategorized and tagged Team 17. Mouldy Toof Studios, The Escapists, Xbox One. Bookmark the permalink.